This weekend, I'll be attending the Asiana Bridal Show in Birmingham. 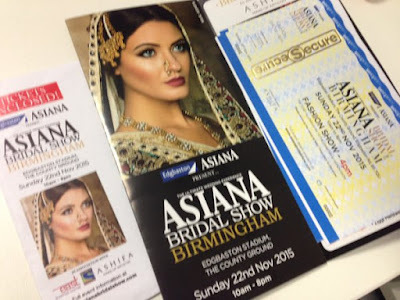 It's been some time since I last attended one of Asiana's bridal shows, so I'm looking forward to seeing what's new! For anyone that hasn't been to this type of event before, it can be a bit daunting. Here are my top tips for "surviving" and getting the most out of the day! These events can get really busy and hectic, with big crowds in small spaces and it can sometimes feel like you're fighting your way through to see what's on offer from the exhibitors. Get there early and you'll hopefully have a more relaxed browse - be aware though, if you're super early some of the exhibitors might not be fully set up yet! Do your research on which suppliers are going to be at the event. Most companies will be talking about exhibiting on their social media channels well in advance. If there's a particular fashion designer, catering company, or wedding planner you're considering booking, why not contact them in advance and see if you can make an appointment on the day? You could see and speak to numerous suppliers, some offering very similar services. The last thing you want is to get home with a bag full of leaflets and flyers and wonder which cake maker had that cake you liked, or what was the name of that MUA who had availability on your dates? Make notes as you talk to people (use your phone, or go old skool with a good old pen and paper if you prefer) so you'll be able to contact your favourites when you get home. As I mentioned before, these events can get extremely busy. You'll probably find yourself in a queue at some point in the day, whether it's for food, the fashion show or even just to get in! You may come across people who want to push in, push past you, or just be rude, whatever you do - don't join them! A little patience goes a long way, so keep your calm, don't let anyone else ruin your day and try your best not to ruin someone else's. For a lot of people (myself included!) the highlight of an asian wedding exhibition is the fashion show. Unfortunately though, front-row seats are limited and in my experience I've found the best seats usually end up being taken by sponsors, VIPS, friends of the show organisers...and sometimes bloggers! So try not to be too don't be disappointed if you're sat somewhere at the back with a view of just the top half of the catwalk. My tip is to pick an aisle seat if you can't get near the front, at least then you have a bit of space to try and see something. These shows always have a host of official photographers and the organisers will *usually* publish photos from the catwalk anyway, either on their website or in their magazine and there'll be plenty posted on social media too. So don't worry too much about taking photos of everything, instead focus on what you like about each outfit and use the fashion show for styling ideas and to help you decide what kind of bridal look you want for yourself. You might go in with a really clear idea of what you want for your big day, but keep an open mind, talk to as many suppliers as you can, because even if a company isn't exactly what you're looking for, they might be able to recommend a perfect supplier for you. Most people in the asian wedding industry know each other and speak to each other so ask them for their suggestions! If you're attending the show this Sunday look out for me and definitely come and say hi!